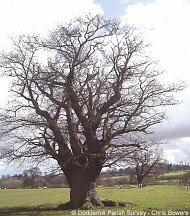 Much of Dodderhill parish lies within the medieval boundaries of the (Royal) Feckenham Forest and the whole area was once densely wooded, as the names Elmbridge, Rashwood and Woodgate signify. Astwood (or East Wood) and Westwood were areas of forest land to the East and West of the main town of Droitwich, and all these settlements would have begun as small hamlets within wooded clearings. The finger of land at Pipers Hill which is in the parish was common forest land, and commoners held the right of pannage (the pasturing of pigs). 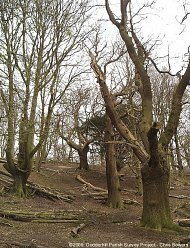 It is believed that the wood land in Dodderhill was managed up to about 1600, with trees pollarded and coppiced to provide fuel for the evaporation of brine to make salt, before the use of coal.